He’s a difficult interview, because he’s introverted and only talks to the media out of a sense of obligation – or, perhaps, actual obligation, dictated by his team. I talked with him at Bankers Life Fieldhouse after practice early in his rookie season. I only got enough to fill an hour-long show by calling his father, a university professor. That was probably a good thing, though, because his dad lent perspective. 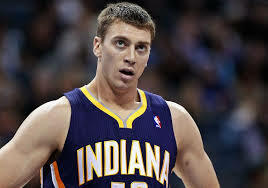 Hansbrough tends to talk in a monotone voice, when he talks at all. He’s zombie-like, just as he is on the court. He plays hard, but shows virtually no emotion. He seems like the kind of guy who could be punched in the face and just stare off into space. As with many of my other guests, this was probably the longest conversation he ever had with a media person. It was probably painful for him, too, but he took it like a man. The Pacers eventually let him go, and Toronto signed him. He’s now with Charlotte. I’m surprised his NBA career hasn’t worked out better. I never thought he’d be a star, but thought he could have a long career as a backup forward. He showed flashes at times, but hasn’t been able to score consistently enough because he doesn’t have a dependable jump shot. That’s puzzling, because he was a 39 percent three-point shooter from the three-point line his senior season at North Carolina, where he remains a legend.